Secret House and Limelight On Oxford present CRIME AND PUNISHMENT, adapted for the stage by Chris Hannan, based on the novel by Fyodor Dostoyevsky, at the Limelight on Oxford, 231 Oxford St, Darlinghurst. 12- 22nd December. First, let us say that all great experiences in the theatre are, mostly, projected from the conceptional and evidential contribution of the Writer. This theatre work is adapted by Chris Hannan from the novel CRIME AND PUNISHMENT, written by Fyodor Dostoyevsky. Dostoyevsky (1821-1881) is regarded as one of the Great Novelists, that reputation based, principally, on CRIME AND PUNISHMENT (1866), THE IDIOT (1869), DEMONS, sometimes known as THE DEVILS (1872) and THE BROTHERS KARAMAZOV (1880). CRIME AND PUNISHMENT is recognised as one of the great books. I read it as a very young man - an essential text for any actor to know, I have often recommended it to actor friends and students - and the psychology of a murderer and his subsequent guilt is so traumatically detailed, that friends of mine would not invite me to 'parties' if I had read that book that day - I was usually so existentially depressed - stimulated - by it. (Although this is not my favourite book of his, THE IDIOT, has always trumped it, and I confess, I have never finished THE BROTHERS KARAMAZOV.) So this theatre experience begins promisingly with its source material. Add, a truly smart adaption by writer, Chris Hannan, prize-winning playwright and novelist, first presented in 2013, and a very rewarding night could follow. Dostoyevsky lived in the middle of the nineteenth century and had a powerful foundational belief in the Russian religious Orthodoxy - the gospels of Christ central to his behaviour. He was a man, because of his experiences in the political, social and spiritual atmospheres of hie time in Russia, influenced, as well, by the writers of the period: Dickens, Balzac, Turgenev and Leo Tolstoy and the great Thinkers of the period: amongst whom Herzen, Kant, Belinsky, Hegel, Bakunin stand out. His actual life was, as Lady Bracknell might say was "Crowded with incident", and when one explores the biography of the man, it certainly is, and that coupled with his crowded 'mindful' life makes for the genius of his work for the edification of his alert heirs on this planet - he, purportedly, was a great influence on the work of Friedrich Nietzsche and Jean-Paul Satre. CRIME AND PUNISHMENT, causes some to regard Dostoyevsky to have the reputation as the "greatest psychologist in world literature". And, certainly, it is that aspect of the novel that has remained indelibly affective in my memory. So, it was a surprise to find Chris Hannan's adaptation to be more arrested with the highlighting of the internal battle that the young murderer, Raskolnikov (Dostoyevsky) has between his religious inclinations and the influences of the contemporary philosophical modes. It was what has made Dostoyevsky to be, possibly, identified as a believer, a Christian Socialist. Many Christian Socialists believe capitalism to be idolatrous and rooted in greed, and a mortal sin. They identify the cause of all inequality to be the greed that they associate with capitalism. So, in a conflict of need, hunger and social humiliation, after dealings with the ruthless and rapacious pawn broker, Alonya, Raskolinokov, a poor struggling law student, reasons that the murder of her, would be no crime, balanced against the collective good he could do with the ransacking of her 'fortune' and spreading it to do good deeds for his fellow sufferers: "Give justice to the weak and the fatherless; maintain the right of the afflicted and the destitute' - this murderous deed will be deemed 'justice' and the act of a 'righteous' man, he convinces himself. Too bad, then, that there is, as well, another victim, the hapless Nastasya, the sister of Alonya, who witnesses the original murder. Raskolnikov has much philosophical angst to struggle with in the aftermath of his Crime - it is his Punishment. This text by Chris Hannan, is surprisingly witty, and full of the cynicism and refracted observations (they can be interpreted as a kind of sarcasm-savage, as well) of a sufferer of the time and government of Dostoyevsky's Russia that are still, tragically, startlingly, relevant to the world that we are centred in today. The text is full of human, comic observations that become quotable aphorisms from the various characters of the play, and is underpinned by the narrative thrust of the psychological disintegration of the 'hero' of the story under the pressure of the jousts he has with the new modern Detective Porfiry Petrovich (his close observational methods predicative of the approach of the psychologists (known, then, as Alienists). THE MURDERS IN THE RUE MORGUE (1841) and THE TELL-TALE HEART (1843), both by Edgar Allan Poe, resonates in this psychological employment, too. (N.B. The Director, Mr Skuse, made adjustments and re-wrote sections of the play in the production we saw). This play provides an extraordinary provocative night. Rare in Sydney theatre going, generally, and even rarer at this time of the year - the Time of Goodwill: Christmas. It is a pity that the consciousness of the Time of Goodwill is not at all times. Too much to ask, I guess, in this materialistic world and its valued value systems. I, also, saw during this week Tarkovsky's film SOLARIS (1972) - another Russian creation - at the Art Gallery of NSW, and took away much philosophical provocation, the most memorable for me being: "In the pursuit of TRUTH we become burdened with KNOWLEDGE" - that's, a paraphrase. 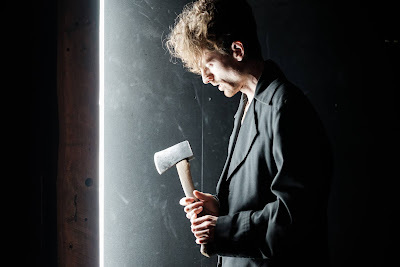 This Russian link of intellectual interrogation of the meaning of existence in 'literature' of all kinds, strikes me profoundly, especially, when I remember most of the content concerns of my own culture in the Australian Theatre this year. To go back to my beginning, the writing, then, of Mr Hannan's adaptation of Dostoyevsky's great novel is up to par and worth the time spent with them both in the new LIMELIGHT space on Oxford. Anthony Skuse with production company, Secret House, have taken on this production and they have assembled a company of young collaborators that give, mostly, a fine disciplined and insightful reading of the opportunities that are provided by these two writers. Jane Angharad, Hannah Barlow, Tim Kemp, Phillippe Klaus, Beth McMullen, Madeline Miller, James Smithers, Shan-Ree Tan, Charles Upton, and Natasha Vickery. The company is young and they may not all have the life or proper imaginative resources (particularly having, mostly, been brought up in this relatively 'lucky' country') to truly resonate the given circumstances of the world of Dostoyevsky's desperation. The Set Design (and costume), by Mr Skuse, is also a distraction - a pretty one - giving an Art Directed glow of comfort for the events of the play (think of the recent film BROOKLYN ), which, instead, really needs to have the stench of the poverty and the crushing social conditions of the world to light us to the reality of these people, for us to be able to understand the behaviour we witness lucidly. The world of this play reminds one of the demands of Maxim Gorky's THE LOWER DEPTHS (1901). A visit to the Matthew Talbot environs down in Woolloomooloo, might anchor it better, for us, than the beautiful solution we have on this stage. The Lighting, by Martin Kinnane, is impressive in its atmospheric shiftings and in its service to the 'arty' aesthetics of his Director, but one wished that the shift from the stage lighting to serviceable fluorescent was not so overt in its indicating. This is true, as well, with the opposing 'poetics' of some of the music scoring, also, Mr Skuse's responsibility - e.g. Church music layered over moments of human degradation - this play, this novel, needs less Directorial aesthetic conceits and, rather, more gutter-truths of the human condition that Dostoyevsky is struggling to illuminate - which is still a contemporary issue. Phillipe Klaus (Porfiry/Marmeladov), Charles Upton (Luzhin, especially his Skabichevsky, Lebezyatnikov), James Smithers (Raskolnikov), Jane Angharad (Dunya) strike, more often than not, the intellectual and vocal resonances of the writer's worlds, to make markers for the audience to identify accurately with. Given time, the rest of this young company may, too, settle further into the worldly confidences of the playwright. Some of the actors still seemed to be grappling with the trajectory of keeping the story afloat at its vertiginous speed of events and the number of characters, without fully experiencing, identifying, the piercing philosophical truths of what they were saying, or, in the immersion with the symmetrical patterns of incident and character of the events and people in the story - the skills of the source writer, Dostotevsky. There was, sometimes, not enough 'interior' life going-on and a touch too much externalising 'melodrama'. With all my carping (and it is purely a personal bias) this production of CRIME AND PUNISHMENT adapted from this great novel is absolutely worth seeing. It is a very brief season, so make an effort if you like your theatre to be 'intelligent', as well as an entertainment, for you will be rewarded. It is a gift at Christmas that will stay with you for some time. Apocalypse Theatre Company presents ALL MY SLEEP AND WAKING, by Mary Rachel Brown, at the Old 505, Eliza Street, Newtown. 28 November - 22 December. ALL MY SLEEP AND WAKING, was an early play (first? ), written by Mary Rachel Brown, first performed in 2002 in a 55 minute one act version, that has had recent and further development with Mentor/Director, Dino Dimitriades, of the Apocalypse Theatre Company. Three siblings, Maria (Angela Bauer), Anne (Di Adams) and Peter (Richard Sydenham) await - with Anne's son, Josh (Alex Beauman) - the passing of their father from a longterm illness - we never meet the father figure. Each of the siblings have weathered his abusive and difficult influence as a sole parent - their mother died when they were young - in different manners. Maria elected to stay in the family home and care for him, Anne fled and refused to have any connection with him (for years), and Peter has found himself bereft and lost in the life that he exists in. The performances are astute and expressed with subtle nuance, and mostly moved by Mr Dimitriades with skill around a fairly unimaginative (budget restricted?) setting (Maria Keys) of working class decay - the usual environs of Ms Brown's concerns. The Lighting from Alexander Berlage exposes the Design, unpityingly, while there is some distraction provided by the reliable work of the Sound Designer, Ben Pierpoint. ALL MY SLEEP AND WAKING, is more an exercise in character reveal than in storytelling. Anton Chekhov, and contemporaneously, Annie Baker, achieved both in their plays: character reveal and narrative trajectory. Theatre Travels presents THE LARAMIE PROJECT and THE LARAMIE PROJECT: 10, by Moises Kaufman and Members of the Tectonic Theatre Project, in the Reginald Theatre, at the Seymour Centre, City Rd, Chippendale. 28th November - 8th December. 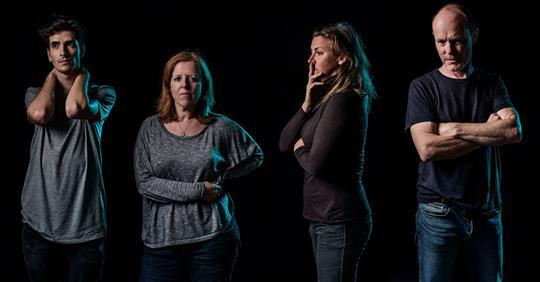 A new theatre company, Theatre Travels, for its opening foray into the Sydney scene, has tackled THE LARAMIE PROJECT, and its sequel, THE LARAMIE PROJECT: 10. Two plays and nearly five hours in the theatre. It seems to be a season of 'marathon' experiences, what with the Sydney Theatre Company's (STC) recent THE HARP IN THE SOUTH and the Ensemble's production of the trilogy of Alan Ayckbourn's THE NORMAN CONQUESTS. Both THE LARAMIE PROJECT investigations reveal themselves as still potently powerful experiences in the theatre - the first play is now 20 years old. Moises Kaufman led the Tectonic Theatre Company with GROSS INDECENCY: THE THREE TRIALS OF OSCAR WILDE, in 1997. (I saw that first production off-off-Broadway before its shift to a national and international play of importance).The company researches, and in the case of THE LARAMIE PROJECTs, interview, to build a verbatim script, massaged to produce an insightful and incisive experience in the theatre. THE LARAMIE PROJECT canon concerns itself with the University of Wyoming gay student's torture and murder: Matthew Shepard - a crime that became an international provocation of the Hate Crime. This young company: John Michael Burdon, Laura Djanegara, Andrew Hofman, Francisco Lopez, Linda Nicholls-Gidley, Matthew Pritchard, Dominique Purdue, Emily Richardson and Charlotte Tilelli acquit themselves with dedicated commitment that illuminate the stories with a freshness and decided detachment that prevents any sentimentality from staining the shocking and provocative political tenor of the material. The two Director's Carly Fisher and Rosie Niven have prepared themselves well (even a visit to Laramie itself) and have chosen a company of fellow collaborators that serve the projects effortlessly. 5 hours of material with 9 actors to play some 75 characters, requires some real foresight - it is no small achievement. They are assisted mightily with a beautiful but also pragmatic Set Design by Dave Angelico, that facilitates all the necessary changes of location and costume changes, under the care of Adrienne Dell. Martin Kinnane, has a challenging task in supporting the narrative with its many shifts and emotional states, with an intricately successful Design for the Lighting. Too, Hamish Stening, makes a sterling contribution with his Sound Design. 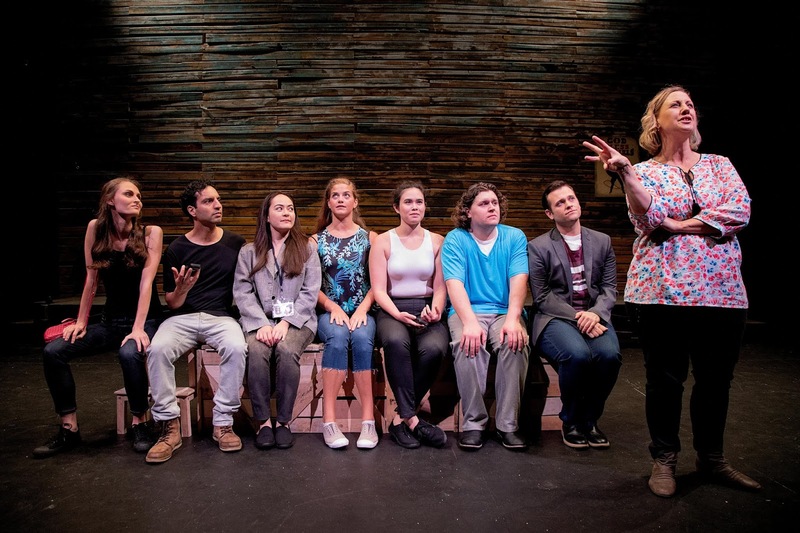 THE LARAMIE PROJECT duo, are important works and are as relevant today as they were then, and as pertinent to the Australian experience as it is to the American one, today. I urge those who have never seen these two works to find a way to capture them - if not both, then certainly, the first (although your curiosity will certainly encourage you to see the other as well). The Reginald Theatre experience gives the Theatre Travels company an auspicious and ambitious debut. It is a brief season, so go Now. P.S. Unfortunately, this new company follows the behaviour of the practice of many of the Sydney Theatres in not acknowledging the writer, Moises Kaufman, and in this case Tectonic Theatre, in their program notes.